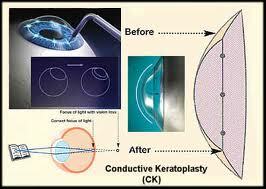 Conductive keratoplasty (CK) is a surgical technique that reshapes the cornea without cutting or removing tissue. This allows light entering the eye to be focused uniformly onto the retina. Unlike laser refractive surgery, CK reshapes the cornea with low energy radio waves. The radiowaves are applied to specific spots around the outer cornea in a circle. The radiowaves are converted to heat, which then shrinks the corneal tissue in contact with the radiowaves. By shrinking the corneal tissue, the cornea becomes steeper. This enables light to be focused onto the retina during close up work. This is suitable for low levels of hyperopia (longsightedness) and presbyopia. In CK, radiowaves are converted to heat, which then shrink corneal tissue to steepen the cornea. This shifts the focal point from behind the retina on to the retina itself. It is therefore effective for those with hyperopia and presbyopia. The only currently commercially available conductive keratoplasty brand is NearVision CK. CAN YOU BENEFIT FROM CK? WHAT HAPPENS BEFORE YOU HAVE CK? A scan of your eye will be taken to determine the curvature of the cornea. This shows which parts of the cornea are steep and which parts are flat. This scan allows your ophthalmologist to plan your treatment. In addition, your eye will be examined carefully to ensure that there are no other problems that could affect your outcome after surgery. 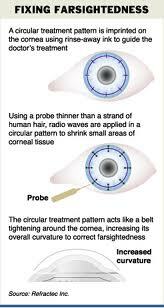 Your CK procedure has to be planned so that the radiowave treatments are applied to the correct areas on the cornea. This ensures that the flattest areas have enough treatment energy to be steepened sufficiently. WHAT CAN YOU EXPECT DURING CK? Conductive keratoplasty is a relatively quick procedure which takes up to 10 minutes to perform. Local anesthetic eye drops are usually sufficient to keep your eye numb and free from pain. A clip is placed to keep your eyelids open. The treatment areas on your cornea are marked for easy identification. Your ophthalmologist will then use a tiny hand-held probe (smaller than a thread) to apply the radiowaves onto your cornea. No sutures are required. Most people feel no pain with conductive keratoplasty, although you may still have a feeling of pressure during the procedure. This is normal. 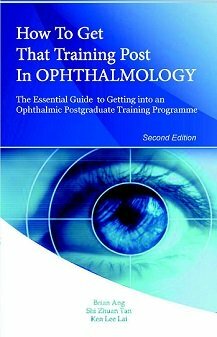 In the unlikely even that you do feel extreme discomfort, do inform your ophthalmologist so that more anesthetic eye drops can be applied. WHAT CAN YOU EXPECT AFTER CK? Your eye will feel slightly gritty, uncomfortable and light sensitive for the next few days. This will settle with the eye drops that you will be given after surgery. You may also be given some special contact lenses to wear for added comfort. Avoid swimming and rubbing your eyes for a few weeks after surgery. You will usually notice an improvement in your near vision within a few days. The trade-off is that your distance vision will become slightly more blurry. This can easily be corrected with glasses or contact lenses. Note: While CK is a safe method of treating problems with close up vision, the effects may be only be temporary. Repeat treatments may be required for longer term results.